Germany will likely miss its goal of cutting emissions by 40 percent by 2020, the country's environment minister said Monday, an embarrassing admission for a government that wants to lead the charge on limiting climate change. "It's painful for me to have to tell you that we will miss the targets we've set for ourselves for 2020," Svenja Schulze told delegates from more than 30 governments who had gathered in Berlin to prepare for an annual global climate summit in December. Setting her country's sights on 2030, Schulze said all sectors of the German economy would have to contribute cuts, but singled out transportation in particular, where emissions remain at 1990 levels. "The least has happened there," she told reporters. Schulze also called for greater efforts to generate renewable energy and for an end to burning coal to produce electricity. 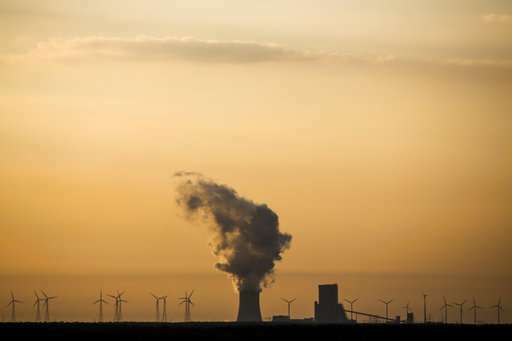 The German government created an expert commission this month to study the politically sensitive issue of coal-fired power plants. The December summit in Katowice, Poland, will provide the first true test of the world's ability to implement the 2015 Paris climate accord. The treaty set a political target of keeping global warming significantly below 2 degrees Celsius (3.7 Fahrenheit) by the end of the century, but left open how that would be achieved. Scientists say the time to achieve the most ambitious goal—limiting a rise in average global temperatures to 1.5 degrees Celsius by 2100—has almost passed. Germany has pushed for international unity on upholding the Paris accord, particularly since U.S. President Donald Trump said he was pulling out of the deal his predecessor negotiated. But Berlin's inability to take drastic steps has led environmental groups to question Germany's credibility on the issue. German Chancellor Angela Merkel and Polish Prime Minister Mateusz Morawiecki are scheduled to speak at the Berlin climate meeting Tuesday.